When scientists are trying to figure out how to live in near-isolation in a dome to simulate a Mars mission, the last thing they'll need is an ill-fitting space suit. So one of the nation's top design schools has come to the rescue. 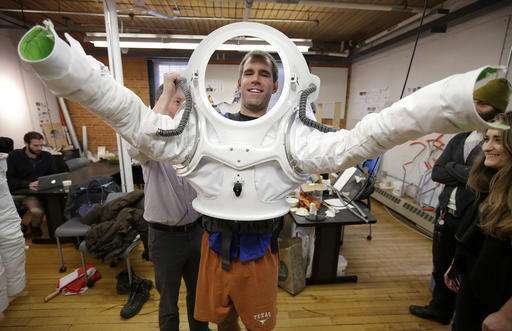 Staff members and students at the Rhode Island School of Design have come up with a new, adjustable suit that closely resembles an actual space suit. 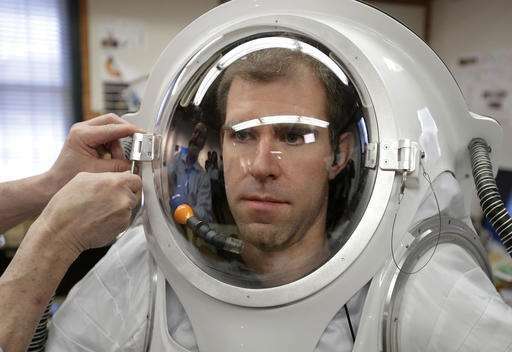 Real space suits are designed to work in zero gravity, meaning they're too expensive and too heavy to use at the NASA-funded Mars simulation mission in Hawaii. 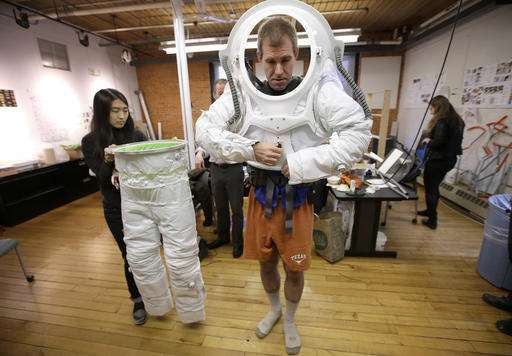 The simulated space suits that are used instead wear out quickly and aren't all that comfortable. They're small and provide poor ventilation. 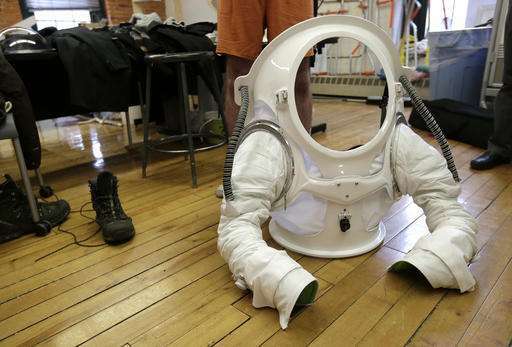 The new suit, unveiled Monday in Providence, is expected to be tested during the next Mars simulation mission in 2017 in Hawaii. A yearlong Mars simulation mission ended in August. It was the fourth HI-SEAS, or Hawaii Space Exploration Analog and Simulation. NASA funded the study, run through the University of Hawaii. Andrzej Stewart was the chief engineering officer on that mission. At 6 feet 2, Stewart couldn't zip up the simulated suits, so he wore a hazmat suit instead, which he said was easy to wear but not very realistic. The entire crew saw a need for a better suit, said Sheyna Gifford, the mission's space doctor. A realistic suit is important, so crew members can see what experiments they can do and what tools they can use while wearing it, and how the habitat should be designed to accommodate it, she said. "What we're aiming for is the best possible simulation, to inform NASA about what we learned on that simulation so they can succeed in the real thing," she said. 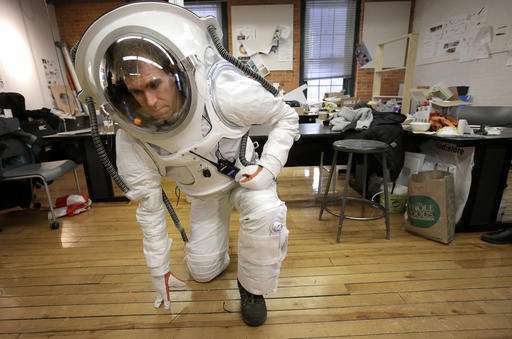 At RISD (often spoken as "RIZ'-dee") on Monday, Stewart donned the new suit to see how it fit, how he moved in it and how well the ventilation and radio communications worked. Gifford was an observer, along with a NASA spacesuit engineer who will provide feedback to ensure that the design best resembles the architecture of suits NASA may use for future exploration missions. It was the suit's first rigorous test. Stewart said that the ventilation kept him cool and that the suit restricted his movement like a real suit would. 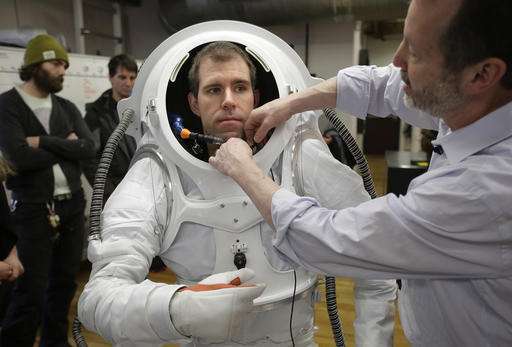 "It's great to finally be able to put on a full suit and be able to walk around, be able to move in it," Stewart said. "It makes me feel a lot more like an astronaut." The white suit is made of heavy-duty nylon fabric; carbon fiber that forms a hard shell for the upper torso area; and foam that replicates the pressurization of an actual suit. It comes in 16 pieces; components can be replaced or resized easily to fit the short and the tall. It weighs about 50 pounds. Work began after Gifford told Michael Lye, the adjunct faculty member who coordinates projects between the school and NASA, about the opportunity to make a more realistic suit. Gifford said the new suit is great, especially its modularity, because it will fit whomever is on the crew, though the exterior ventilation tubes will have to go inside the suit so they don't get caught on something or crushed. 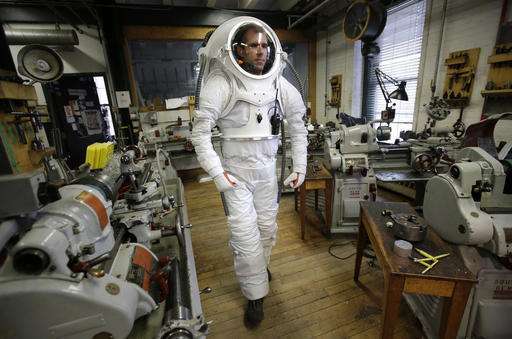 The suit, the only one RISD made, will be shipped to HI-SEAS, Lye said. The materials for the suit cost about $10,000, paid for with grants from the HI-SEAS program and the Rhode Island Space Grant Consortium, Lye said. Students in the industrial design and apparel design programs worked on it. RISD is one of the country's top art and design schools and has a large industrial design department. It has worked with NASA before, including on a project to design space gloves.